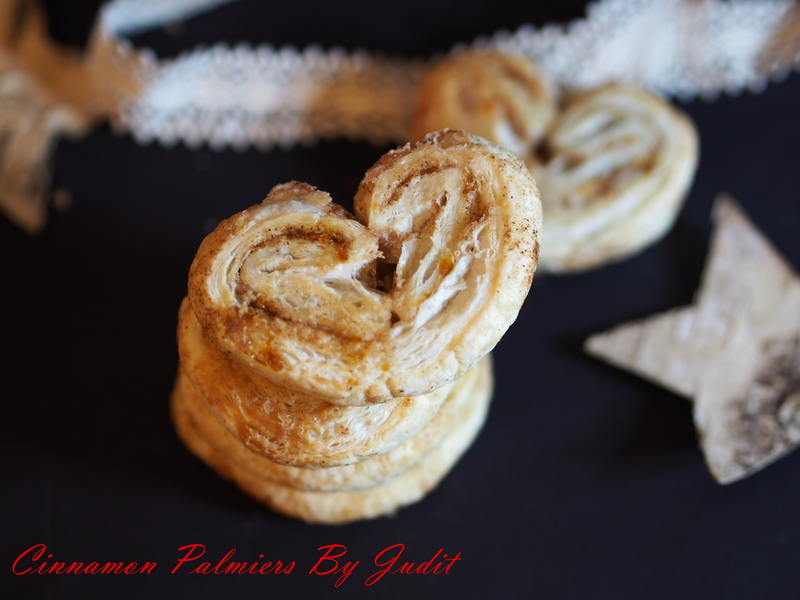 Orange, Ginger and Cinnamon Palmiers | When Judit bakes...bread and better.. 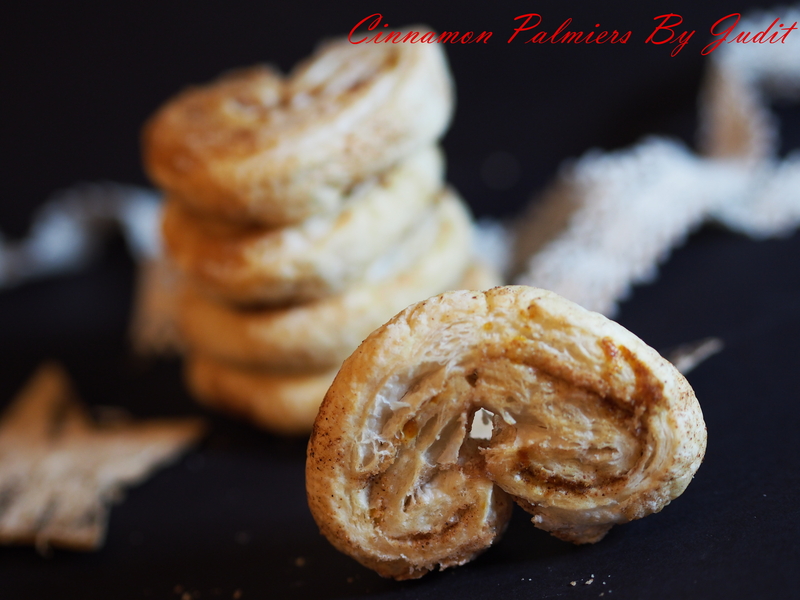 The name of the Palmier cookies mean “palm tree” in French, called so for their shape resembling a palm leaf. Palmiers are made by rolling a sheet of puff pastry in sugar, and folding it twice in opposite directions.The name suggests they were first made in France, but there is no evidence confirming this.It is believed the French adopted the Middle Eastern method of layering thin sheets of pastry with sugar and spices. Whilst it is not documented who first came up with the idea, research shows the cookies were invented in the beginning of the twentieth century. In fact, a recipe for palm leaves (Palmenblatter) can be found in Viennese Cooking from 1960, which suggests this pastry might have commanded a broader swath of geography. Many support the idea that Palmiers originated in Vienna, where they are traditionally served with coffee or tea. These cookies are highly addictive, with the indulgent flavours of butter and caramelized sugar. Place the flour and salt in a large mixing bowl. Add the lard and rub the lard into the flour. When the flour and lard mixture has the consistency of breadcrumbs, add the cold water. Mix it in with a palette knife to keep the mixture cool. When the mixture comes together to form a dough, turn it out onto a clean, floured surface and knead briefly until just smooth. Form the dough into a rectangular block (this will make it easier to roll out later), wrap in cling film and refrigerate for 30 minutes. Place the butter between two sheets of greaseproof paper and tap with a rolling pin to form a flattened block about one-third the size of the pastry. Roll the dough out onto a clean, floured surface into a rectangle. Visually divide the dough into three sections and mark the sections with light press. The center section will hold the butter, so place the butter in the center of the pastry rectangle. Fold in the edges of the pastry to completely enclose the butter. Form the pastry into a neat square. Turn the pastry a half-turn and carefully roll out again into the same size rectangle. Fold the top and bottom of the rectangle into the center, folding the pastry into thirds. Repeat the turning, rolling and folding process one more time. Place in the fridge to cool for 30 minutes. Remove the pastry from the fridge, turn the pastry a half-turn since the previous rolling, roll out and fold once again. Repeat. Rest the pastry in the fridge for another ten minutes the remove it from the fridge and turn, roll and fold it twice more. The pastry should have been turned, rolled and folded six times. If the pastry is still streaky, repeat the turning, rolling and folding process one more time. Preheat the oven to 190 degrees C. Cover a large baking sheet with parchment or a silicone mat. Set aside. Combine the sugar, cinnamon, ginger and zest together in a small bowl, stir well with a fork. Sprinkle some of the sugar mixture over a working surface, then roll one half of the puff pastry into a square. Sprinkle more sugar evenly over the pastry and roll the rolling pin lightly over the surface to adhere the sugar. Fold in two opposite sides of the pastry square so the sides meet in the center. Sprinkle some sugar, and repeat the folding. Sprinkle more sugar again, then fold one half of the pastry over the other. Cover loosely with parchment and place in the freezer to firm up, for about 30 minutes. With a sharp knife cut the chilled roll crosswise into thick slices. Dip the cut sides of each piece in the sugar mixture and arrange, cut side down, on the prepared baking sheet. Bake the palmiers in batches until golden and caramelized on the bottom, about 15 minutes. Turn the cookies over and bake until golden on the other side, about 7 minutes more. Transfer the baked cookies on a rack and cool completely. 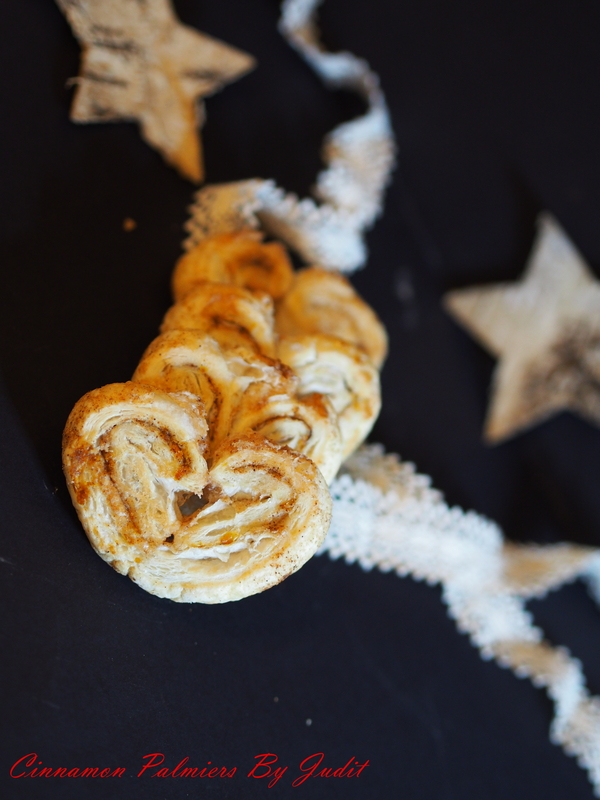 This entry was posted in Baked treats, Biscuits and Cookies, Just Everything, Sweet Bakes, Treats for Life and tagged Palmiers, puff pastry, rolling pin, sugar mixture. Bookmark the permalink. The number of things you are able to do in the kitchen never ceases to amaze. Wonderful write up and photographs, and also great advice with the opening quote: “Eat well, laugh often, love abundantly.” Have a great weekend. Oh, there is so much more, so I will try to keep amazing you! J.
Pingback: Teaparty Trio: Chocolate-almond cookies, Zingy Palmiers and Versatile Sponge | When Judit bakes...bread and better..